1.1. Jenny Craig Weight Loss Centres Pty Ltd ACN 006 109 842 (Jenny Craig, we, our, or us) respects your privacy, and is committed to complying with its obligations contained in the Privacy Act 1988 (Cth) (Act). 1.3. Jenny Craig is committed to protecting the privacy of all individuals it deals with, and will treat your personal information confidentially and according to the Act, which include the Australian Privacy Principles (APPs), which set out the ways in which an organisation can collect, use, disclose, store, and provide access to personal information. 1.4. Personal information is information or an opinion, whether true or not, and whether recorded in a material form or not, about an identified individual or an individual who is reasonably identifiable. Personal information also includes sensitive information, which includes information about an individual’s health. d. our business service providers and contractors. g. you have contact with Jenny Craig in person. b. with your express or implied consent. We may collect your name, age, gender, telephone number, address, email address, medical history, health information, payment details (including credit card and debit card details) as well as any previous weight-loss services and products that you have received from us. In our day-to-day dealings with you, we may collect information relating to general weight-loss matters, product enquiries, as well as complaints. In the context of our business relationship, we may collect your name, ABN or ACN, address telephone number and email address. We may collect your name, telephone and email address, as well as information, references and reports arising out of the assessment of your potential suitability as our employee. 3.2. Jenny Craig may also collect your name and contact details which you provide to us, in order to respond to your questions and comments about Jenny Craig and its products and services. 3.3. Jenny Craig will only collect your personal and sensitive information where you have consented, or otherwise in accordance with the law. 3.5. Personal information that Jenny Craig collects is held in different formats, including in both hard copy and electronically. 3.6. If Jenny Craig receives personal information about you that it has not requested, and Jenny Craig would not be able to collect this information under the APPs if it had requested it, then Jenny Craig will destroy or de-identify the information where lawful and reasonable to do so. 3.7. You are not required to disclose your personal information to Jenny Craig, however, if you do not do so, we may not be able to provide you with any health and weight-loss products or services that you have requested, or provide you with an appropriate response to your enquiries. 4.1. The way in which Jenny Craig will use and disclose your personal information depends on the reasons for which it was collected. 4.2. Jenny Craig will only use or disclose your personal information for the main reason for which it was collected (such as to provide you with health and weight-loss products or services, or to respond to your enquiry), for a directly related purpose, or otherwise where you have consented to such use or disclosure or the use or disclosure is in accordance with the law. g. investigate your feedback regarding our products and services. 5.1. Jenny Craig may, from time to time, use your personal information to provide you with health and weight-loss updates and information, information about other products and services, details of current promotions and so that it can undertake market research or research into health and weight-loss services and products. This information may be shared with you using a variety of channels, such as direct mail, email and telephone. We may also collect and use your demographic and other data for market research, statistical, advertising and promotional purposes. 5.2. Jenny Craig will only provide you with such communications in accordance with the law. 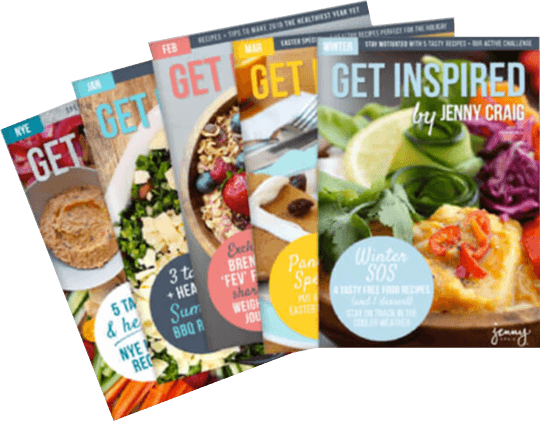 If you do not wish to receive these communications from Jenny Craig, please follow the unsubscribe op-out option at au-jennycare@cjc.com or write to us at: Jenny Craig (attn. Customer Care) Level 1, 464 St Kilda Road Melbourne, Victoria, Australia 3004. 6.2. Jenny Craig does not share your personal information with other organisations unless you give Jenny Craig your express consent, where sharing is otherwise required or permitted by law, or where this is necessary to enable Jenny Craig’s contractors to perform specific functions, such as to assess or carry out your request. Where lawful and practicable, you have the option of dealing with Jenny Craig anonymously or by using a pseudonym, including through our website and social media pages. However, Jenny Craig will generally require your contact details if you would like us to transact with you. 8.1. Jenny Craig will take all reasonable steps to ensure that your personal information is protected against misuse, interference and loss, and unauthorised access, modification or disclosure. 8.2. When your personal information is no longer needed for the purposes for which Jenny Craig is authorised to use or disclose it, we will take reasonable steps to destroy the information or ensure it is de-identified unless such information is required to be retained by law. 9.1. You have the right to request access to the personal information you provide, and to correct or update your personal information. This right is subject to certain exceptions allowed by law. c. Jenny Craig may charge you a reasonable administration fee, which reflects the cost to us for providing access in accordance with your request. 9.3. In certain circumstances, Jenny Craig may refuse to allow you access to your personal information where this is authorised by the law, such as where giving access would have an unreasonable impact on the privacy of others, or where providing you with access would be unlawful. 9.5. If Jenny Craig refuses your request for access or correction, it will provide you with written reasons for the refusal, and how you may complain about the decision. 9.6. Furthermore, you may instruct us to remove any previous consent you may have provided to receive marketing communications from Jenny Craig or to remove you from its database. 10.2. Jenny Craig will also collect site usage data through its use of internet cookie technology or similar devices. Cookies are small data files which record your visit and may collect statistical information about your visit (such as the pages you visit on our website) in order to customise and improve your website experience. Most internet browsers will accept cookies automatically, but you can delete or disable cookies by changing your browser settings, however some parts of our site may not work properly if you do. This information may be analysed to provide us with insights into users interests and behaviour, and may include the use of websites using a range of common technical tools, including cookies, pixels and transparent GIF files. 10.3. For completion, a cookie is a small file of letters and numbers that is put on your computer if your browser settings allow this. These cookies allow our service provider to distinguish you from other users of the website which helps them to provide you with a good experience when you browse our websites, and also allows us to improve our site. 10.4. For completion, the third party analytics services applied to our website also track a user’s online activities across unrelated websites and allows for customised presentation of advertising material to your browser (using adware). We do not receive reports that identify you, however the providers of the analytic services may be able to identify users from your IP address, and may use this personal information about your internet use for their own purposes or those of other clients. Two such services which are utilised are Google Analytics and Doubleclick. 10.5. Furthermore, some of our webpages may contain links to other third party sites. Whilst we take reasonable steps to ensure this is always clear, we do not take responsibility for any collection or use of personal information if you choose to click on these links, and you should refer to the privacy policies of the relevant third party in this regard. 11.3. This policy does not create or confer upon any individual any rights, or impose upon Jenny Craig any rights or obligations outside of, or in addition to, those imposed by the Act. b. investigate and attempt to resolve your query or complaint within 30 business days or such longer period as is necessary and notified to you by our Privacy Officer. 12.3. In the event that you are dissatisfied with the outcome of your complaint, you may refer the complaint to the Office of the Australian Information Commissioner.